What Is The Best Outdoor Winter Workout? What is the best outdoor winter workout? The cold weather is here which means no training outside. What we need is something to cool off growing tempers and crowded gyms. Here's an outdoor plan that could be fun. Try it out. The cold weather is finally here which often means no training outside in the fresh air. What we need is something to cool off growing tempers and more crowded gyms. It's cold outside but you've had enough of the crowded gyms. You know you should exercise and are determined to stick with your training to maintain your physique and ultimately reach your fitness goals. The best outdoor workout includes both resistance training and cardio. Go for a 15-minute hike through the snow. This is guaranteed to work your legs. *Be careful. Avoid any twisting of the spine and never put your back in a vulnerable situation. 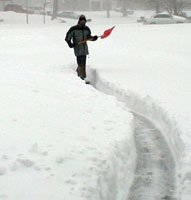 Proper shoveling technique includes a bend at the knees, scooping up the snow with the shovel, standing up and walking the snow a few steps away before dumping it. Many people injure themselves during the bent rotation while tossing the snow away. I do not recommend any rotational movements to those with pre-existing back problems. Stay safe. 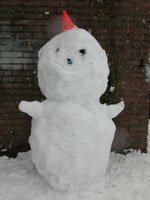 Make a Snow man / Snow woman / Snow fort - You'd be surprised how much energy it takes. It can be a good family friendly activity too. Go tobogganing. Obviously not for everyone but the marches back uphill make for a good leg workout. Pull a weighted sled through the snow. Go skating. Make sure the ice is thick and will not break. What Makes This A Great Workout For Winter Weather? This workout is great for winter weather since it includes an appropriate warm-up, resistance training and cardiovascular activity with a cool down. It's not too much to leave you stuck in a chair the next day, but it isn't too little that you feel as if you haven't done anything. After this workout you'll walk away with a sweat and a sense of accomplishment. Always dress accordingly to the conditions - It's the winter. T-shirts and shorts are no longer an option. Opt for multiple layers, thick warm socks, gloves and a toque. You should still be able to move but you shouldn't be really cold outside. Never attempt exercise without a sufficient warm-up - Exercising stiff muscles increases the risk of injury. Think of your body as a big engine. When you first start the engine, it takes a little while to get going, after a few minutes the engine is ready to go - the same applies to your body. NEVER train when the weather is too rough - considering going for a run in a blizzard is NOT an option. Don't train alone - Have someone in the area in case something goes wrong. Never train in a completely secluded area as the weather may change and jeopardize safety. Living in Canada, I'm subject to a solid 4 months or more of winter weather. While most people sit inside and put on the 10 pounds they lost over the summer - or on top of the weight they tried to lose - I try to stay active. All the time indoors drives me stir crazy. I've tried this workout and other similar variations. I recommend this workout to those healthy enough to participate in outdoor activities in the cold. Consult a qualified physician before participating in winter activities.